T-shirts and books featuring Gene Anthony's 60s photography. San Francisco was the epicenter of the decade's social, political and cultural change, and Anthony was there with his camera and clear vision to capture the groundswell from dream to discord. His pictures shout life! action! and the accompanying prose is first-hand and top-rate. From street sign and crowd scene to artists like Jim Morrison and Jerry Garcia on the road or on a break, Magic puts you there, at the corner of Haight and Ashbury, with the decade rippling around you. 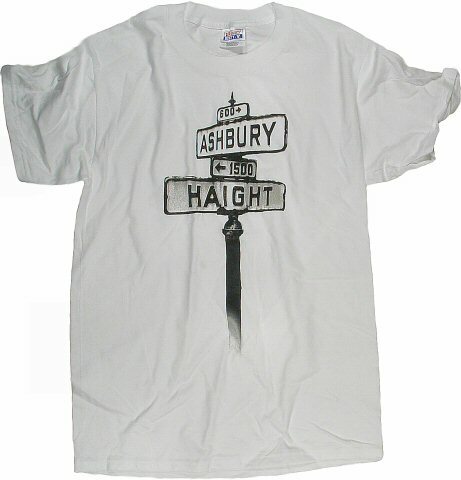 This shirt, and many more featuring Gene Anthony's 60s photographs are available.